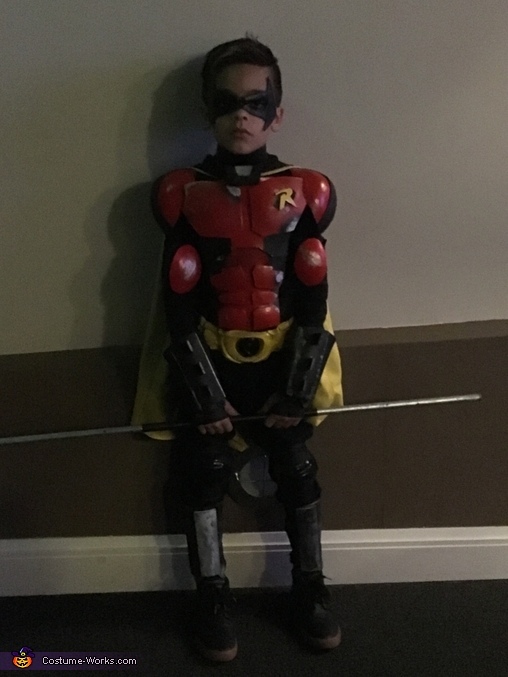 My little brother Nicholas is wearing the Robin costume. I made all the armor out of Eva foam and was inspired by young justice robin for the design. The staff is made out of a metal pipe painted silver with black electric tape. The mask is made of latex from Rogue Design Fox and used spirit gum to glue to face. I painted the armor with rust open spray paint and used makeup to paint eyes black. This costume took me about a month to build and is so far my best costume yet. Nick wore this costume to a costume contest at Seminole Theater and one first place. I hope he wins first place here as well.